What do Adolf Hitler, aliens and wild dogs have in common? Believe it or not, they all feature in this issue of Creation magazine—along with basalt lava, dung beetles and the big bang. 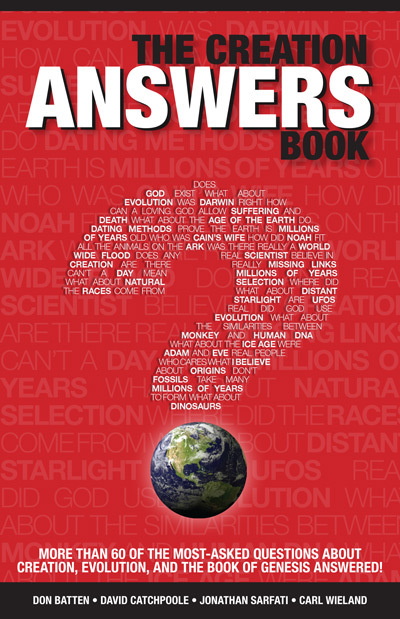 Creation is a biblical worldview magazine, and as such it deals with pretty well everything. Readers often say it helps them see their world differently and equips them to handle everyday life better. The way we see our world is important to our well-being. A person with insight is able to see danger ahead and avoid it. Others, oblivious to the consequences, charge into disaster and pay a great personal price. Evolutionary ideas can blind people like that. In this issue we have a sobering article about Hitler, Stalin and Mao—names that send a chill down the spine (see Darwin’s impact—the bloodstained legacy of evolution). Raymond Hall shows that these tyrants did not arise in a vacuum. In each case, the evolutionary theory of Charles Darwin was the seed. In each case, the whirlwind of devastation began as Darwin’s ideas were applied in political life. Creation is a magazine that tells a different story. Only 80,000 are printed worldwide but what a boon to those who subscribe. Where are the younger generation turning for purpose and meaning in an impersonal, evolutionary world? Would you believe, to aliens? Surprisingly, there is a logical evolutionary connection to these extraterrestrial ideas, as Gary Bates explains (see Aliens in your bedroom?). But there is an answer. But surely it is naïve to expect people who believe in evolution not to apply it in everyday life. The more powerful their position, the more devastating will be the effect of their evolutionary ideas on our society. Only creation gives the true foundation—for morality, good government and personal worth. That’s why Creation magazine talks about fossils (Tiny pterosaur’s untimely end, Moulting arthropod fossilized in a flash! 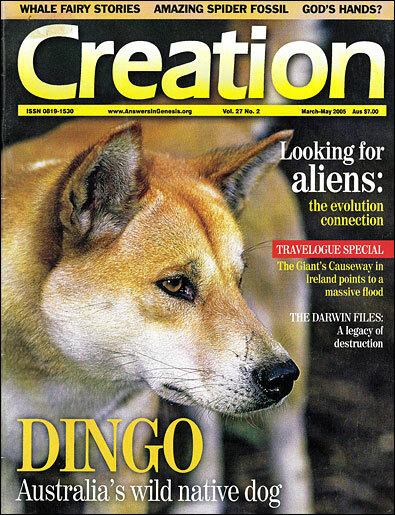 and Zippy fossil finds), dingoes (The Australian dingo: a wolf in dog’s clothing) and the big bang (Secular scientists blast the big bang). Such articles show it is mistaken to be ‘a passionate Darwinian when it comes to science’, because the evidence is best explained by the Bible. And contrary to what we are led to believe, many research scientists believe in creation in six days, like agricultural scientist Greg Dalton (see Caring for creation). We also feature Giant’s Causeway, the tourist icon in Northern Ireland (see A giant cause), because people who visit this spectacular site are not told they are viewing dramatic evidence for Noah’s Flood. But Creation readers will be better informed, and can use such articles to help their friends see the world from the true biblical perspective. Creation magazine is one of the most significant tools you have to protect your family, help your loved ones, and uphold positive values in a world adrift from a Christian foundation. So when you have finished with this issue, why not pass it on to a friend so they can benefit, too? Better still, why not arrange a gift subscription and let them have their own copy that they can share with their friends? Refuted by Mortenson, T., National Geographic is wrong and so was Darwin, 6 November 2004. Kluger, J., Is God in our genes? Time, 25 October 2004. Notions like this are answered by Wieland, C., My genes made me do it, 6 December 2004. Refuted by Sarfati, J., 15 ways to refute materialistic bigotry: A point by point response to Scientific American, 20 June 2002. The Descent of Man—Episode 1: The Moral Animal, broadcast on The Science Show on the ABC Radio National, 22 January 2000, http://www.abc.net.au/science/descent/trans1.htm.